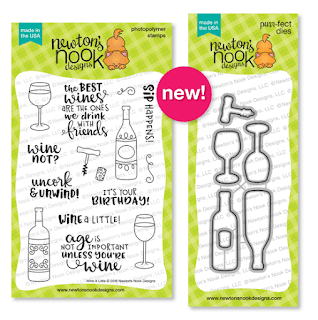 Hello Newton fans and welcome to day 3 of our reveals at Newton's Nook Designs! Today, you may notice we have a theme going? How many of you are wine and or coffee drinkers? Well, to be honest, I enjoy both. Wine on occasion and coffee every single day! On my first card, I just wanted a simple little design. 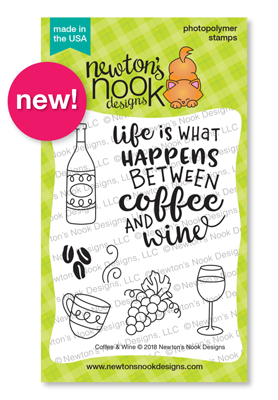 I LOVE the font on the main image from this stamp set, "Coffee and Wine", which is the sentiment. I thought it was fun to stamp all the little coffee and wine images like a wreath sort of. It was so much fun to color these little cuties! 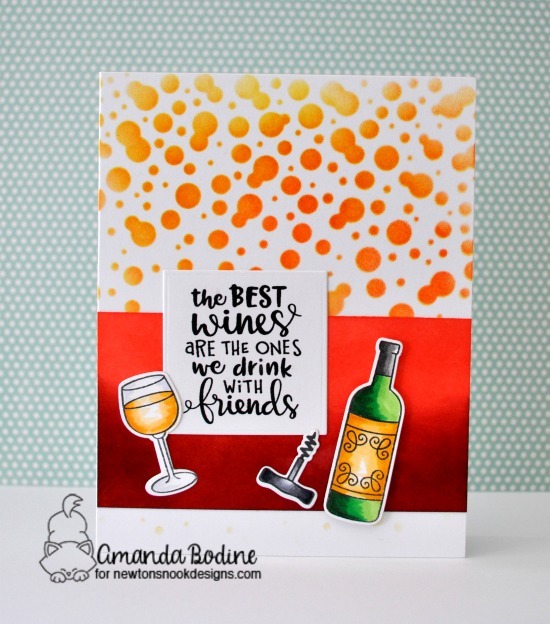 Next I used the stamp/die combo "Wine a Little" to create this fun card. I started by stenciling the background using a NND stencil, Bubbly I stamped out and colored the images and mounted them on a distress inked banner. A very simple card to make that I think turned out quite good. So I hope you've enjoyed my cards today, keep scrolling and comment for your chance to win one of these sets! Would you like to win the “Wine A Little or Coffee and Wine” Stamp Set? Cute cards! Love the stamps. Thanks for sharing such great onspiration for the adorable sets!! Love the bubbly on the second card. The coloring on the first is fantastic. Such fun cards and love your coloring! Beautiful cards, your coloring is gorgeous!! Love these! The images look like so much fun to color! Love the coloring on these wine cards! So realistic looking & beautiful! Very cute cards! Love these stamps. SO great! I love these! The wine one is wonderful! Great job using the new released goodies! Wow! Your coloring is fabulous! I can't get over how bright and intense it is! Both cards are just stunning! Great cards, they both look amazing. My favorite is definitely the one about wine and friends! Fabulous stamp sets and fabulous cards!! Great job by the design team!!! Awesome coloring on your fun cards! Love the new sets! Good night, you sure can color 180 degrees from dark to light. I love the contrast you achieve! You’ve made two fantastic cards !! The color combos you choose are so perfect ! Awesome cards! They are so fun and colorful. your cards are colorful and cute!